The Pelvic Health Physical Therapy Level 1 course is a 3-day live event focusing on the basic skills necessary to treat patients with pelvic health dysfunction with primary emphasis on under active pelvic floor muscle conditions. The focus of the labs will be on external and internal vaginal examination. The student-to-teacher ratio will be 8:1 to ensure adequate supervision during the labs. Lectures will cover anatomy of the pelvic girdle, physiology of micturition, dysfunctions of the lower urinary tract and pelvic muscles as well as patient history examination, and testing and treatment interventions for the patient with under active pelvic floor muscle conditions. Urogynecologic surgeries,medication, prevention of pelvic floor dysfunction and documentation will also be discussed. 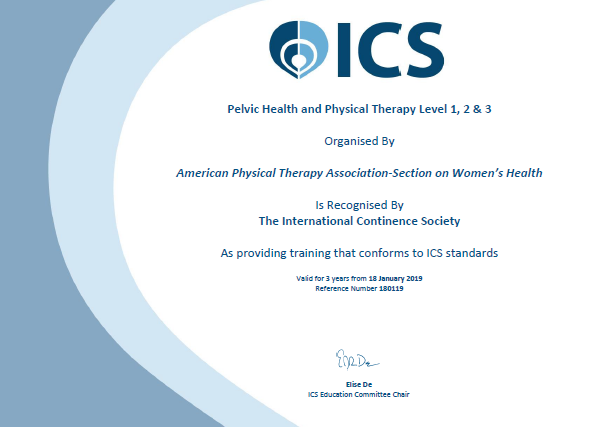 The Pelvic Health Physical Therapy Level 1 course is recognized by The International Continence Society (ICS) as providing training that conforms to ICS standards. When you enroll for the Level 1 course, you also get complementary access to the Urogynecological Clinical Evaluation and Treatments, Level 1 (2.0 contact hours) online video course. 2. Describe the function of the lower urinary tract and female pelvic organs. 3. Demonstrate proper infection control techniques involved in pelvic floor muscle examination. 4. Perform an external evaluation of the female genitalia verbally identifying bones, ligaments,muscles and other structures. 5. Perform an internal pelvic examination identifying muscles, ligaments, bony prominences with identification of pelvic floor muscle origins and insertions. 6. Demonstrate proper technique in testing muscle strength of the levator ani muscles. 7. Demonstrate proper technique in testing for pelvic organ prolapse. 8. Demonstrate proper use of handheld EMG biofeedback to assess pelvic floor musculature. 9. Differentiate between under active pelvic floor muscles and overactive pelvic floor muscles. 10. Demonstrate an understanding of bladder tests and measurements (bladder diary, urodynamic testing, pad testing, etc.) that are used in the process of differential diagnosis. 11. Demonstrate the ability to compose a plan of care including functional goals, prognosis and length of care for the patient with under active pelvic floor conditions. 12. Explain red flags related to treatment of the pelvic floor and understand when to refer to another healthcare provider. 13. Understand urogynecologic surgeries and their effect on prognosis and pelvic floor muscle dysfunction. 14. Demonstrate understanding of various medications and their effects on the bowel and bladder and identify how that may affect prognosis for a patient with pelvic floor muscle dysfunction. 15. Explain the effects of pelvic floor under activity and proper technique of pelvic muscle exercises for rehabilitative purposes. 16. Explain the relationship between the abdominal muscles and the pelvic floor muscles as they relate to activities of daily living. 17. Describe the various interventions available to strengthen the muscles of the patient with an under active pelvic floor and clinically reason when and why the various interventions might be used. 18. Demonstrate proper use of a handheld pelvic floor muscle electrical stimulation unit and explain its appropriate uses for a patient with pelvic floor muscle dysfunction. 19. Describe techniques that can be used to train (retrain) the bladder and when each intervention might be used. The PH1 course is recognized by The International Continence Society as providing training that conforms to ICS standards. For more information about this recognition standard and the course, please visit: www.womenshealthapta.org/phpt1.